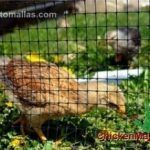 CHICKENMALLA Poultry netting provides great advantages as compared to traditional metal chicken wire mesh. Plastic chicken netting can replace hardware mesh especially in climatic conditions that would favor rusting and oxidation of hardware cloth like tropical and subtropical humid areas, or installations near coastal areas where the ocean breeze would carry salt and accelerate the oxidation process of the metal chicken net. Synthetic poultry net will resist Uv rays and not be subject to corrosion due to high ammonia concentration of intensive poultry farming, Also pig farms will need to keep wild birds out of their installations for sanitary reasons and to prevent wild birds from receiving a free lunch eating animal feed. These pictures should provide a few ideas to hep you in your final decision… will it be metal or plastic?